Just an early draft, people. This is a bit of a hodgepodge of a post, an attempt to pull together some disparate bits into one post rather than bombard those subscribing to this site by email. It mentions a few new publications that I have co-authored as well as the final stages of preparing the ebook I have been working on for publication. Gallagher, M. (2013 Pending). 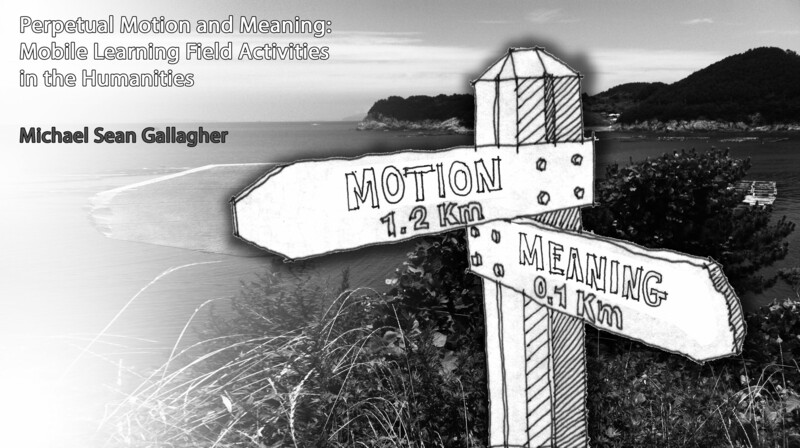 Perpetual Motion and Meaning: Mobile Learning Field Activities in the Humanities. This is the ebook and I will speak a bit more about that below. Truth be told, the hardest part of writing this book was coming up with a title. I am still on the fence on what it will be so consider that a placeholder for now. Bayne, S, Gallagher, M, Lamb, J (under submission). Being ‘at’ University: the topologies of distance students. More to come for this one, but it is one of the best papers I have ever been involved in. It draws on data collected during the Edinspace project at the University of Edinburgh which explored the nature of presence and geography for online learners. I am still drawing inspiration from that project for my work on mobile learning. This paper advances some concepts for elearning that I think have great merit for theorizing mobile learning and I am eager to see it released. Ross, J.; Gallagher, M.; Macleod, H. (accepted). Making distance visible: assembling nearness in an online distance learning programme. This paper draws from interview data from Edinspace as well and from literature on distance learning and online community. The concept of ‘nearness’ emerged from the data analyzing the comings and goings of students on a fully online programme. It proposes that “nearness” to a distance programme is a temporary assemblage of people, circumstances and technologies. This state is difficult to establish, and impossible to sustain in an uninterrupted way over the long period of time that many are engaged in part-time study. Interruptions and subsequent returns should therefore be seen as normal in the practice of studying as an online distance learner, and teachers and institutions should work to help students develop resilience in negotiating various states of nearness. Four strategies for increasing this resilience are proposed: recognising nearness as effortful; identifying affinities; valuing perspective shifts; and designing openings. On a side note, I have loved, absolute loved, my collaboration with my colleagues at the University of Edinburgh, specifically the MSc in Digital Education. They are inquisitive, intelligent, curious, and passionate about what they do and it is what all education should look like. My great Finnish colleague Pekka Ihanainen and I answered an open call for papers from the Joint Research Centre from the European Commission that attempted to envision open learning and OER in 2030. Our take involved revisiting our burgeoning Pedagogy of Simultaneity (PoS) as a potential model for collaboration and learning in the future. Truth be told, the exercise of projecting into the future was fun and rewarding; it forces one to rethink some of the concepts we take for granted now in learning (availability of brick and mortal schools, strict institutional identities, etc.). I co-authored this with two great Turkish colleagues, Nilgun Keskin and Firat Sarsar. Nilgun I had worked with previously on MobiMOOC and the subsequent MobiMOOC Research Team. This chapter explores some ebook reader initiatives taking place in Turkey, Korea, and elsewhere and what those projects involve. I am in the final stages of preparing the ebook and it has proven educational, specifically in the requirements and specifications for each of the different services. So my sister and I are pushing along with the illustrations (some early drafts of which are below) and I am formatting the various versions for future submission. I will be submitting to Kindle Direct Publishing directly and through Smashwords as a vehicle for publishing to the other services (Apple, Barnes and Nobles, etc.). I have also considered (more for fun than anything else) making it available for purchase via this site via Sellbox, a nifty little mechanism for selling content (or whatever) through Dropbox. I have stumbled across this excellent guide for formatting an ebook via HTML (which seems to be the only ‘safe’ way to guarantee the expected results). Amazon and Smashwords both make available helpful information on formatting the manuscript, but they are significantly different from one another. So there will be a few different versions of the manuscript being produced. I will speak in more depth on this once it is actually published as a sort of lessons learned that will hopefully prove useful for any aspiring authors out there. Some drafts of illustrations below, all very early stage. These are just conceptual renderings at this point, more illustrative of our collaborative process than a final rendering. But they are, for lack of a better word, cool.